The 829MW Liberty power project is located in Bradford County, Pennsylvania, US. The Liberty CCGT power plant commenced operations in October 2016. Siemens H-class turbine technology was installed at the Liberty power project. Image courtesy of Siemens AG. 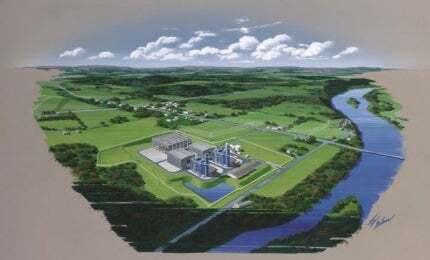 Panda Power Funds developed an 829MW combined-cycle power plant called Liberty Power Project, located in Bradford County, Pennsylvania, US. The natural gas-fired facility is the first power plant located within the Marcellus Shale gas formation region. The US Department of Environmental Protection approved the project in October 2012. Ground-breaking was held in May and the plant commenced operations in October 2016. The project created more than 500 jobs and produces enough clean energy to power one million Pennsylvanian homes, while offsetting 330 million tonnes of CO2 from the atmosphere. Moxie Energy subsidiary Moxie Liberty proposed the development concept of the natural gas power plant in Pennsylvania. Panda Funds acquired and closed financing for the project in August 2013. The project is expected to bring investments worth $5.97bn into the area’s economy during construction and the first ten years of operation. The site is located in Asylum Township of Bradford County, approximately 45 miles north-west of Scranton, and measures roughly 33 acres (13.3ha). Florida Power and Light Company is developing the new 1,250MW energy centre to replace the existing Port Everglades power plant. The plant comprises two identical ‘single-shaft’ power blocks, each including a combustion gas turbine and a steam turbine, which drives the electric generator. Waste heat from the combustion turbine exhaust is directed through a heat recovery steam generator for producing steam required for running the steam turbine. Exhaust emissions from the turbines are lowered to permit levels using selective catalytic reduction (for NOx control) and oxidation catalyst (for CO reduction) processes built inside the heat recovery steam generators. The steam in the turbine is exhausted to an air-cooled condenser. Large cooling fans condense the steam into water, which is reused in the heat recovery steam generator. The Liberty project comprises Siemens SGT6-8000H gas turbine package, consisting of a turbine and a generator. It is the first project in the US to install Siemens SGT6-8000H class gas turbines. "The project produces enough clean energy to power one million Pennsylvanian homes." The turbine has a gross power output of 274MW and an operational efficiency of more than 60% in combined cycle operations. It has a faster cycling capability with the help of its fast-acting variable guide vanes. The active turbine clearance control system comprises a hydraulic clearance optimisation system, which helps to reduce engine performance losses. Equity financing for the Liberty project was provided by Panda Power Funds and institutional co-investors. Goldman Sachs, Credit Suisse and Ares Capital provided debt financing for the power plant while Union Bank acted as the documentation agent. Siemens Financial Services provided $50m in term-loan financing for the plant construction. The engineering, procurement and construction contract for the CCGT power plant was awarded to the joint venture of Gemma Power Systems and The Lane Construction. The contractual scope also includes the engineering and procurement for the balance of the plant. Siemens Energy was awarded a $400m contract for the supply of power plant blocks for the Liberty project. The equipment comprises one SGT6-8000H gas turbine, one SST6-5000 steam turbine, one hydrogen cooled SGen6-2000H generator and one heat recovery steam generator, along with the overall electrical system and the SPPA-T3000 I&C system. The contractual scope also includes long-term maintenance and service for the power plant units. The contract for conducting engineering and detailed design services for the Liberty project was awarded to Burns and Roe, a company based in New Jersey.